In the prestigious Palazzo Pitti, Firenze, the last date of the comprehensive scheduled project “Un Anno ad Arte”, on the fifth anniversary of Amerigo Vespucci’s death. 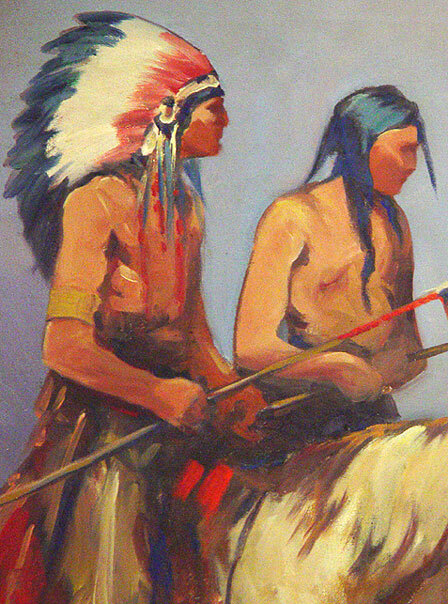 This exhibition, called ”La Nuova Frontiera, Storia e Cultura dei Nativi d’America dalle Collezioni del Gilcrease Museum” (The new Frontier, history and culture of the native Americans from the collections of Gilcrease Museum, Oklahoma) by Herman J. Viola and Robert Pickering is dedicated to the original inhabitants of America, unjustly called Indians. The issue is journey, which is meant to be a careful homage to the Florence- born explorer, who first realized that the lands he discovered were not parts of the West Indies, as Columbus thought. He was facing a new world, which fairly would be later called America after him. Counterbalancing the long sequel of prejudices and errors by European colonization from the seventeenth to the nineteenth century means to enhance the historical and cultural background of the native American tribes. They deserve to come out to a public larger than the limited anthropological research groups thanks to the unparalleled, extensive and renowned collections of the Gilcrease Museum of Tulsa, Oklahoma. William Thomas Gilcrease, an oil businessman, faithful to his partial Native American heritage, collected a tremendous amount of both artistic and crafted items of America’s original inhabitants. In the effort of establishing a broader awareness of the roots, he found in 1949 the Gilcrease Museum in Tulsa, Oklahoma, one of the most important centres for the study of the Native American history in the USA. Now it is jointly run by the Tulsa City Council and the local university. The visitor of the Florentine show gets acquainted of a culture, too often defined wild, perceiving the richness and dignity of these peoples overshadowed by colonists. A restoration process which pairs another Italian exhibition on the same issue, held in Santa Giulia, Brescia in 2007- 2008, together with the Museum of Fine Arts, Boston, and the Wadsworth Atheneum in Hartford, Conn.
Now in the Palazzo Pitti’s ”Galleria del Costume”, one is faced by the colorful arrangements of beaded- embroidered waistcoats and mocassins of the Sioux Lakota tribes, the Cherokee embroidered leather coats and impressive Navaho necklaces. They are perfectly able to stand there next to the permanent exhibitions of the Renaissance dresses, worn by the Florentine Renaissance princes. 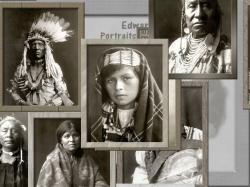 The other section of the exhibition, in the Andito degli Angiolini, offers a more historical perspective with oil paintings and photos by Edward Sheriff Curtis. The mountains and forests of the Far West inspired artists such as William Robinson, Leigh Joseph Henry Sharp and George Catlin who fixed on the canvas the backgrounds where the Native Americans lived and fought. 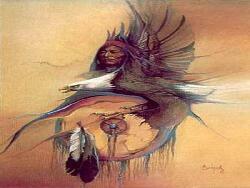 No disrupting effect between the hosting site and the Native American show. The two worlds, so wide apart, don’t collide here. The two cultures, joined historically and geographically by the Florentine 16th century explorer who bravely challenged the sea looking for knowledge and wider horizons, can set up a dialogue beyond any possible Europe – centered evaluation. The new world of Vespucci appears to us compellingly new, being so close to the contemporary need of a sustainable standard of life which has to be respectful of natural environment and of its laws in order to survive.